Streamlined, beautiful to look at and evironmentally friendly, Bio Ethanol fireplaces are the hottest thing on the street right now. Except they're not on the street... they're on coffee tables, hearths and even set into the walls of homes across the UK. These fires encompass everything people are looking for in a centrepiece in their home; requiring little or no installation, no flue or chimney and emitting little or no smoke or fumes; Bio Ethanol fireplaces only need a supply of the specifically developed fuel which arguably makes these fires so special. Bio Ethanol is derived from plant crops and is available in two distinct types, the first is a light, colourless liquid that resembles water and the second is a gel form, it is completely safe to for use in domestic homes which need a focal point with no concern over pollution at all. Some fires will work with both types and some only with one, the fuel is easily purchased from the supplier of your fire. Bio Ethanol fuelled fires are a simple to use and effective solution for homes which need a focal point but where building regulations may prevent the installation of a traditional fireplace, where the fireplace has been block off or indeed where there is no fireplace at all! This is because some model's can actually be placed straight onto a coffee table, lit and enjoyed in the traditional fashion that families have enjoed for countless years. Wall Fires provide a more traditional way of enjoying real flames within your home; being mounted on the wall with brackets makes it easy for homeowners to choose exactly where to place the focal point in their living space, but unlike traditional fireplaces, you're able to change your mind and alter the location of the fire with probably less fuss than it takes to move that bookshelf in the corner! Freestanding fires are just what they say they are... designed to stand freely on what would otherwise be an empty hearth or onto the floor. Much like the wall fires these are available in a range of styles to compliment or contrast both contemporary and traditional decor. The other advantage of Bio Ethanol fires is that they can also be taken outside! The portable range of Bio Ethanol fires have no moving parts they are relatively weatherproof, although It is recommended that you check before purchase. These isn't anything better to create that special atmosphere during a summer evvening that a Bio Ethanol fire that could bring the extra little bit of sophistication to your event! Popular among interior designers for thier contemporary finishes and the flexibility of their application, Bio Ethanol fires are poised to become the must have fires of 2011! Bio Ethanol fires are a stylish and convenient solution for those who lack a fireplace or even for adding a special touch to a dining room which otherwise might lack a certain warmth. 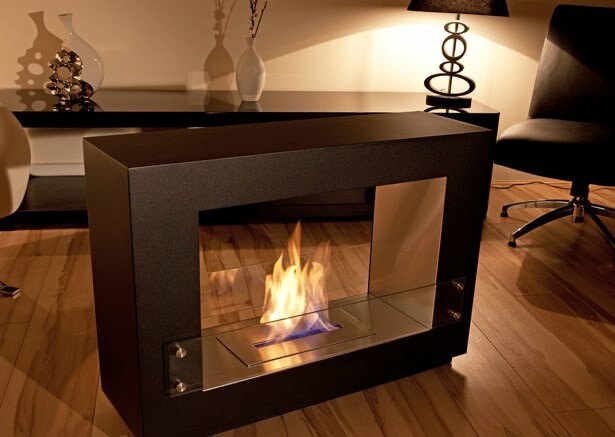 Many Questions spring to mind when considering the purchasing a Bio Ethanol Fire. The main one that comes to mind is What heat will it actually provide me? Most of the larger Bio Ethanol fires would probably put out around 3kW of heat depending on where the fire is situated e.g. It would produce less heat if situated within an area of strong draft or near an opening door. 3kW is normally adequate to compliment existing heat sources and is more than which you would get with an electric fire. Bio Ethanol Fires are easy to maintain and fill. To add fuel simply pour into the container and touch with a naked flame. To extinguish the flame simply replace the lid. Cleaning the fires only needs to occur every 3 or 3 uses and simply involves rinsing with soapy water. Read manufacturers safety instructions carefully before using and always follow precautions necessary with naked flames in a home and you should encounter no problems at all.